The name of this view may lead to some confusion. RadGridView does not support HTML rendering, and there are no plans to support it. This view enables using row layout similar to the one existing in HTML tables. In fact, you can take an existing HTML table and use its HTML code in RadGridView. Sometimes this can save a lot of work. Just change the cell text to be the unique name of the desired column. To use an HTML view we should instantiate HtmlViewDefinition and add the desired rows and cells. At the end simply set the ViewDefinitions property to the newly created ViewDefinition instance. You need to assign the view definition to the ViewDefinition property of RadGridView as described in theoverview section. 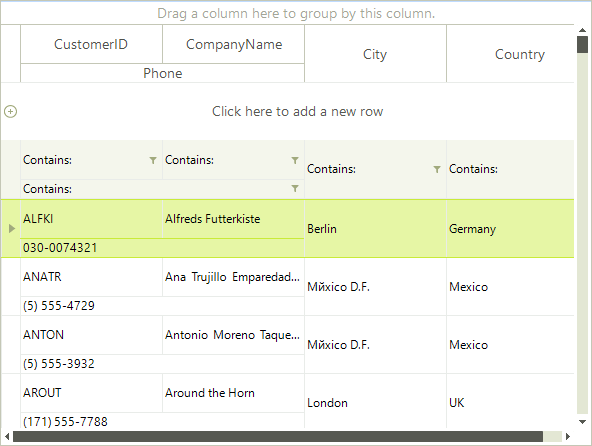 You need to either create the columns manually or supply a data source which will generate them.